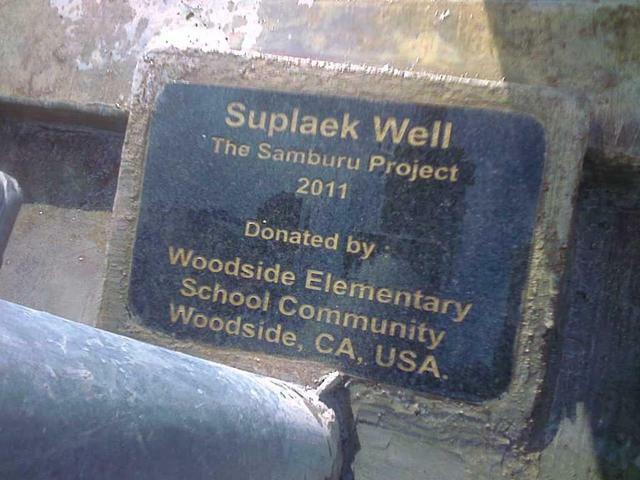 The 3rd well funded by the Woodside Elementary School Community in Woodside, CA, The Samburu Project drilled and installed a shallow well equipped with a handpump in the Supalek community. 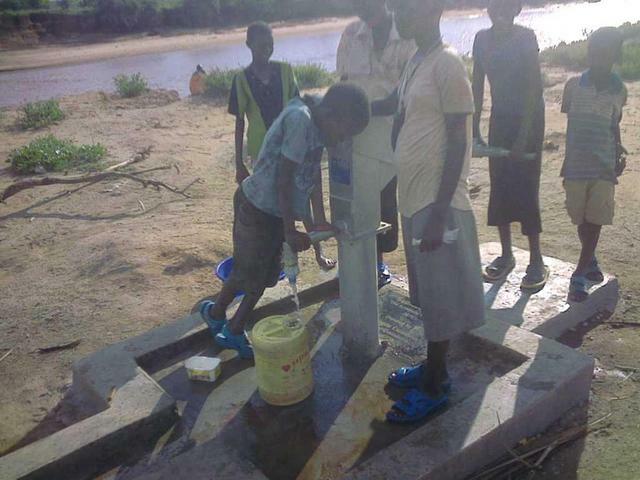 This community has a high rate of waterborne disease. 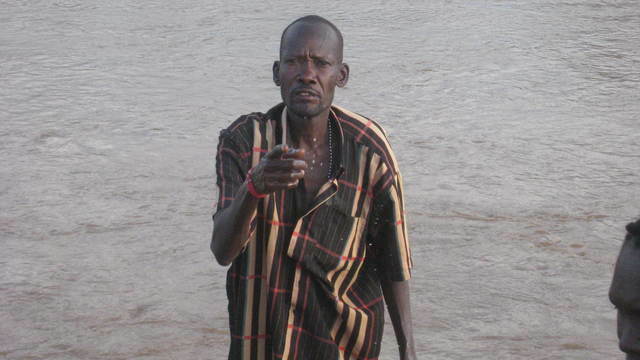 Because they fetch their water from the Ewaso Nyiro River, there is a high incidence of crocodile attacks. Community members must currently walk about 10 minutes to reach the river. 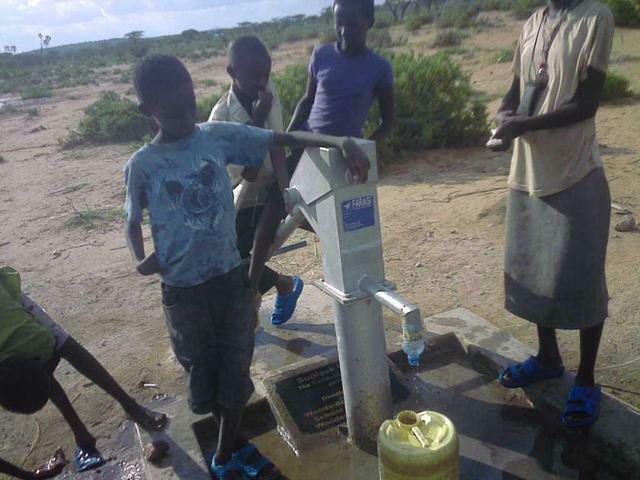 A well will greatly improve the hygienic standards in the Supalek community. They will use the water for domestic purposes as well as livestock. We arrived at Archer’s Post a little after 5:30 PM and after we dropped of my luggage in my room, we headed straight to the Supalek Well. Since it was getting late in the evening, Lucas called Maria, the chairwoman of the well and asked whether it would be convenient for us to come by. When we arrived at her village, Maria was standing at the bush fence along with some children waiting for our arrival. She immediately approached us and after giving Lucas a warm handshake, she took my hand and drew me in for a very close embrace as she expressed her hospitality and her thanks. I was immediately drawn to her by her soothing voice, quiet strength, and her gentleness and kindness. She walked with us to where the well was drilled this past August and I was surprised that even at six in the evening, there was still a steady flow of people coming and taking water from this well. She told me that this well is used by 10 villages in the area and her particular village has about 40 members. The well is mainly used by the women in these communities who take the water and use it primarily for feeding their livestock and families. 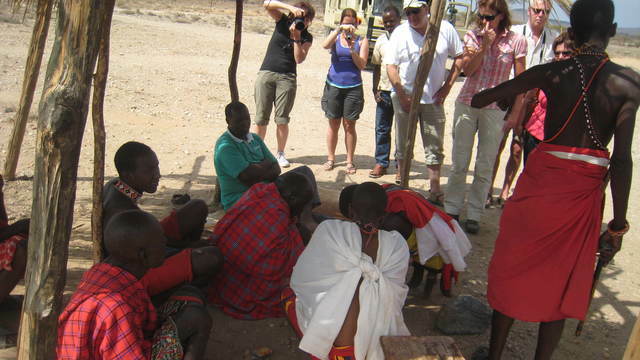 Before they had this well, Maria described how they would have to walk about one kilometer to the river bed. Though the distance may not seem so great, she went on to say that in order to find water, they would have to dig shallow holes into the sand and the water they could find would be murky and dirty. 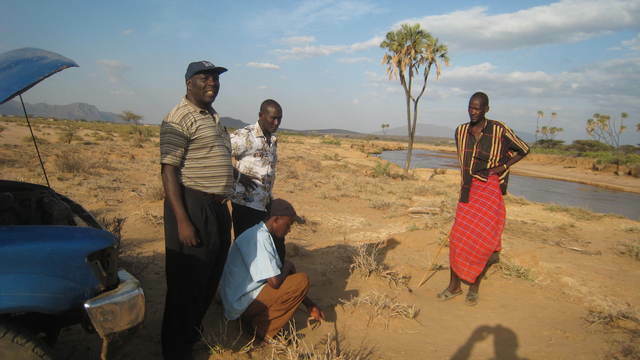 During the rainy season, the river beds are after a downpour. This was actually the first riverbed that I saw during my time here that actually had a flowing body of water. As I came closer to the edge (still on higher ground) to take a better picture of the river, Lucas warned me “Don’t get eaten by a crocodile!” I laughed at first and then turned around to see that he was completely serious. Maria explained to me that there are many crocodiles that live in the riverbed throughout the year. Before this well, when they were forced to draw water either from the flowing river during the rainy season or hand dug holes during the better part of the year, women and children were very vulnerable to crocodile attacks. It was not uncommon to hear of livestock or children who had to fetch water on behalf of the family to have been confronted by one of these powerful creatures. In fact, one of the goats from her community was killed only two days ago. (From that point on, I was careful to stay very far away from the edge.) Maria revealed that most people unfortunately died from the bite(s) –she knew of 20 people that died from a crocodile incident and only 10 that survived the attack. Those 10 survivors however have many problems- some do not have hands, others walk with a limp, and still others are blind. I had heard about the dangers of wildlife during my other well visits but this was the first well where conflicts with wild animals seemed to be a regular danger when fetching water. 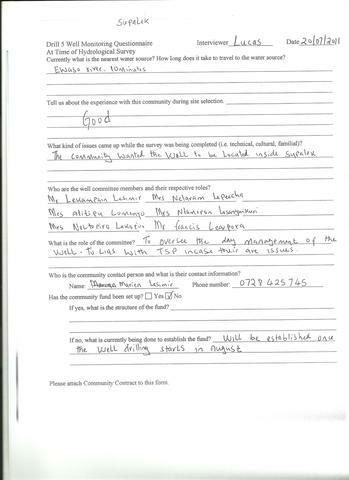 Lucas filled me in that this a big reason why we drilled the well in this area. 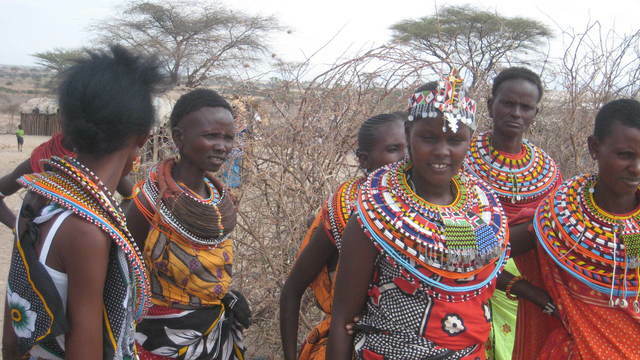 Now that they have a safe, clean water source, women are able to engage in other things, such as making jewelry, gathering firewood, caring for children, and tending after tourists! I found out that there are many travelers that pass through Archer’s Post, especially during the summer time. 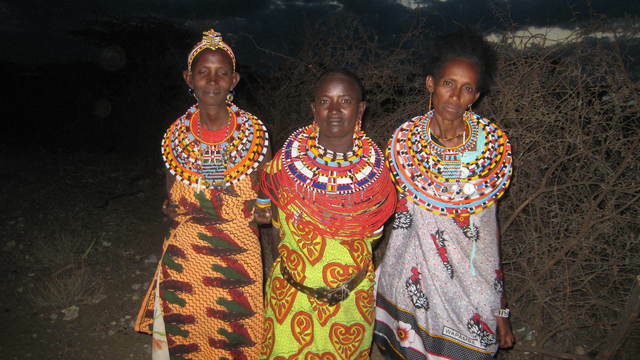 Now that they have more times on their hands and are no longer debilitated with water-borne diseases all day, women can now spend more time on their beadwork and jewelry to sell to these tourists. 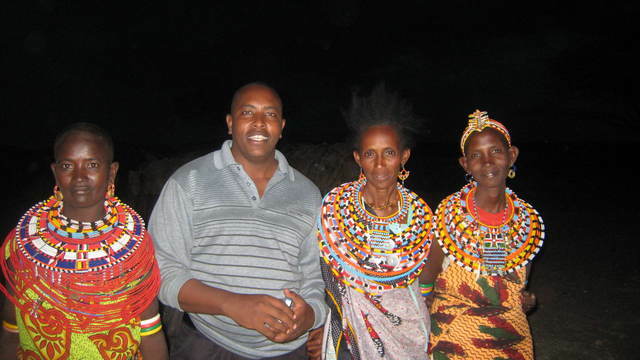 I was encouraged to hear that instead of each community for themselves, these ten villages work together as one big community and they share the profits amongst each other. 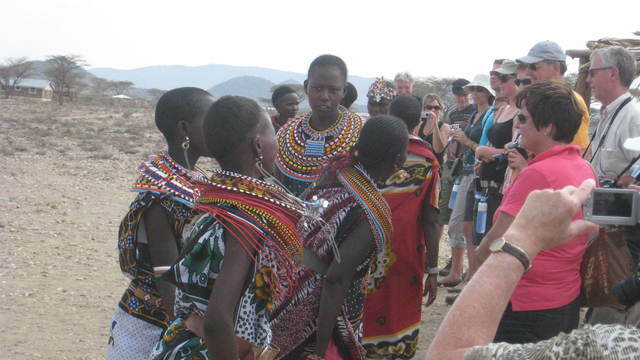 During the high season, they can make a total of 5,000-15,000 KES ($62.5 – $187.5) each day! 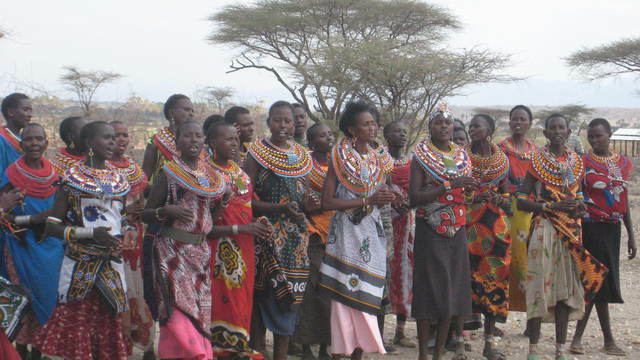 With water they can not only spread their culture but also make a living. As for the children, they are now able to go to school. 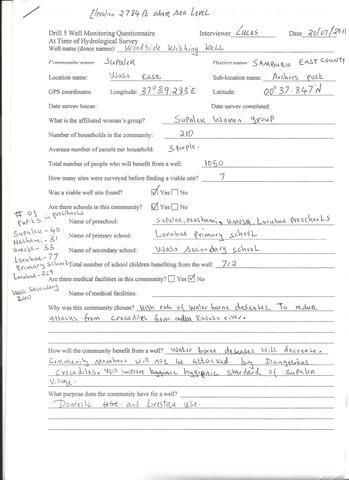 In fact, in her community, they were able to start a preschool where toddlers as young as two years old now attend. From her particular village of 40 people, most of the children (about 20 or so) now attend school whether it be nursery, primary or secondary. When asked what was the ratio of girls to boys, Maria said that most of the school children are girls, mainly because there are more girls than boys in this village. 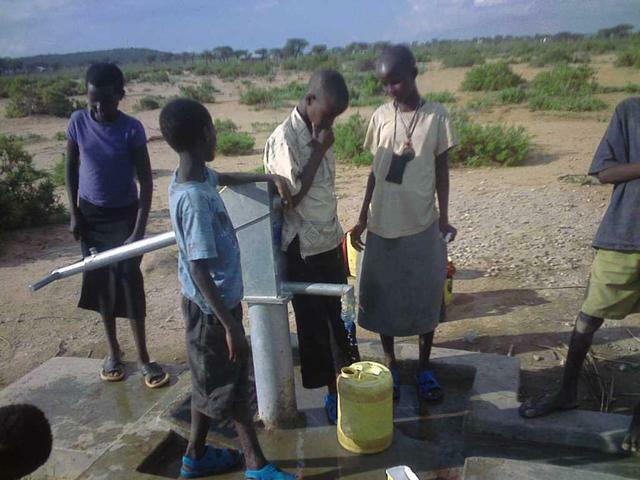 While we were still on the topic of school children, I told Maria that this well was funded entirely by school children back in the States! 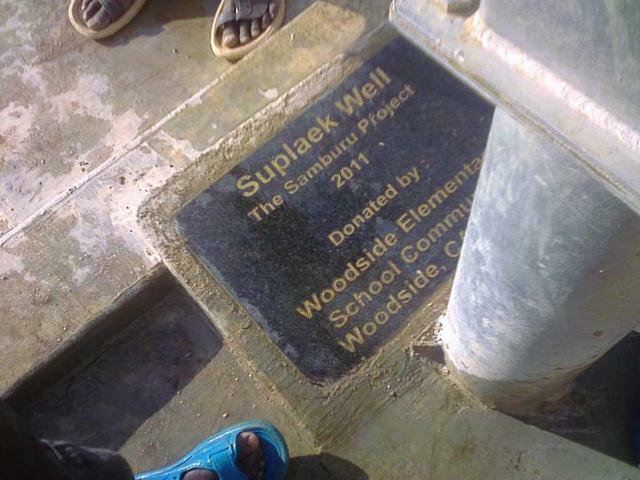 These students from Woodside Elementary School worked tirelessly in their fundraising efforts and even held a walk-a-thon to raise enough money to drill this well. We asked if she had anything she wanted to say to these children and she began by saying how much they appreciate the well because of the benefits clean water brings. She encourages the Woodside students to continue their efforts because she can testify personally the good things that they have done for this community. She hopes that one day there can be wells all around Archer’s Post to help everyone who still doesn’t have access to clean water. She ended by saying thank you on behalf of herself and the community and she hopes that one day these children can help her and her people again. Hearing about the work that these students put in and seeing the fruits of their labor reminds me that we are never too young or small to make a big difference in this world! Bravo!!!! We eventually succeeded to have a viable site for drilling near Supalek village. The folks from Supalek were very happy. Attached are their pics. The tourists too joined the celebrations. Am soooooo happy." 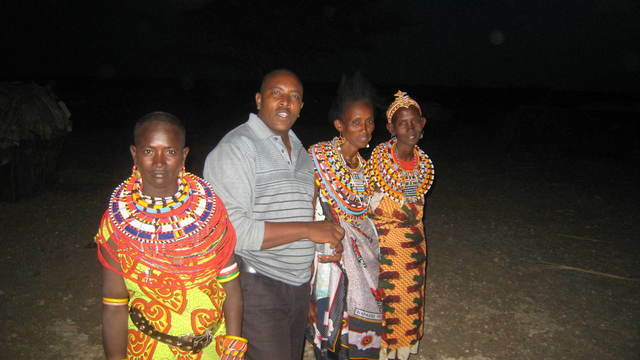 "We had a memorable time at Supalek. I was able to meet with Maria and her husband. This really brought back good memories while I was working for Christian Children's Fund now Child Fund. I used to have a special bond with this village. However, we were not able to get [a] potential site for drilling but will go back tomorrow to survey again as Kariuki is optimistic that we will get a site there. Attached are the pics from this wonderful community." A water committee has been formed. They will oversee the day-to-day management of the well and communicate with TSP if any issues arise. 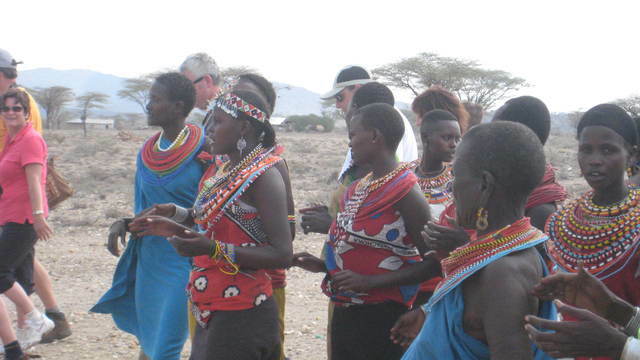 The community fund will be created when well drilling begins in August 2011. 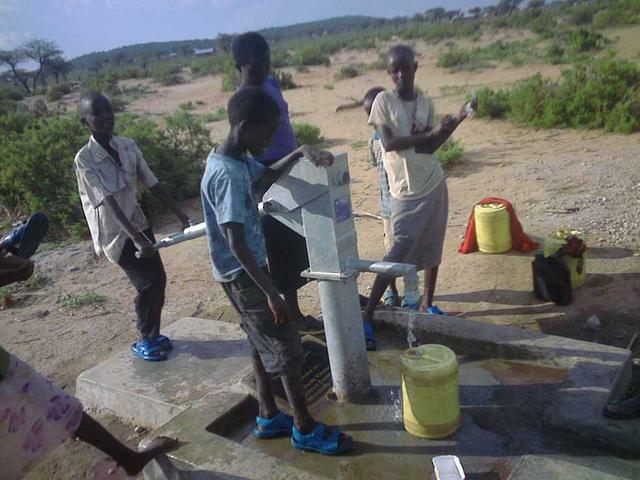 The community wanted the well to be located inside Supalek.